In ancient times, giants ruled the Arctic. For hundreds of years, Inuit stories of these creatures have been carried down from generation to generation, whispered in the night. 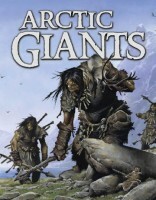 Arctic Giants is the only full-length volume to chronicle the legends of these giants of the North. Based on Inuit oral tradition and extensive, meticulous research, Arctic Giants unsparingly tells each horrifying legend. Written in the vein of the Brothers Grimm and illustrated in an evocative, gothic style, this book is bound to become part of Canada’s fairy-tale canon.